A simulation of how the eclipse will appear from Fairfield. The outer grey circle is the Earth's penumbra, and the inner black circle is the umbra. Any part of the Moon which passes within the black circle will be unilluminated, while any part within the grey circle will appear less bright than usual. The Moon will pass through the Earth's shadow between 22:14 and 23:16 EDT, creating a partial lunar eclipse. 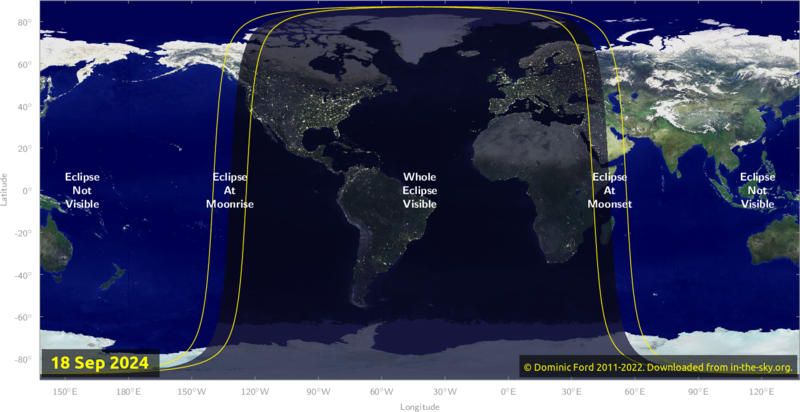 The eclipse will be visible any location where the Moon is above the horizon at the time, including from Africa, the Americas, Europe, Western Asia and Iran. It will be visible from Fairfield in the south-eastern sky. The Moon will lie 37° above the horizon at the moment of greatest eclipse. Maximum eclipse will occur at 22:45, when 8% of the Moon's disk will lie in shadow (all times given in Fairfield time). Eclipses of the Moon are easy to watch with the unaided eye. A modest pair of binoculars will give a superb view of the Moon's surface, but are not required. Unlike solar eclipses, lunar eclipses are entirely safe to look at without the need to look through any kind of filter. They occur whenever the Earth passes between the Moon and Sun, such that it obscures the Sun's light and casts a shadow onto the Moon's surface. The eclipse will begin at 20:42, when the Moon first enters a region of the Earth's shadow called the penumbra. In this outer part of the Earth's shadow, an observer on the Moon would see the Earth partially obscuring the Sun's disk, but not completely covering it. As a result the Moon's brightness will begin to dim, as it is less strongly illuminated by the Sun, but it remains illuminated. At 22:14, the edge of the Moon's disk will enter the Earth's umbra. This is the region of space in which an observer on the Moon's surface would see the Earth completely obscuring the whole of the Sun's disk, and would find themselves suddenly thrust into darkness. As an increasing fraction of the Moon's face creeps into the Earth's umbra, it will appear to have a growing bite taken out of it. We will see our planet's circular shadow sweep across the face of the Moon. The table below lists the times when each part of the eclipse will begin and end. 22:14 02:14 Moon begins to enters the Earth's umbra. Partial eclipse begins. 23:16 03:16 Moon fully outside the Earth's umbra. Partial eclipse ends. The geometry of a lunar eclipse. Within the penumbra, the Earth covers some fraction of the Sun's disk, but not all of it. In the umbra, the Earth covers the entirety of the Sun's disk. Any parts of the Moon's surface that lie within the Earth's umbra will appear unilluminated. Image courtesy of F. Sogumo. Lunar eclipses occur when the Sun, Earth and Moon are aligned in an almost exact straight line, with the Earth in the middle, such that the Earth casts a shadow onto the Moon. The diagram to the right shows this geometry, though for clarity the Moon is drawn much closer to the Earth than it really is. The Moon passes close to this configuration every month, when it is at full moon, but because the Moon's orbit around the Earth is tipped up by 5° relative to the Earth's orbit around the Sun, the alignment of the three bodies into a straight line usually isn't exact. The Moon's orbit is tipped up by 5° relative to the Earth's orbit around the Sun, represented by the grid above. Lunar eclipses only occur at full moon if they occur when the Moon is close to the Earth–Sun plane, at points called the Moon's nodes. 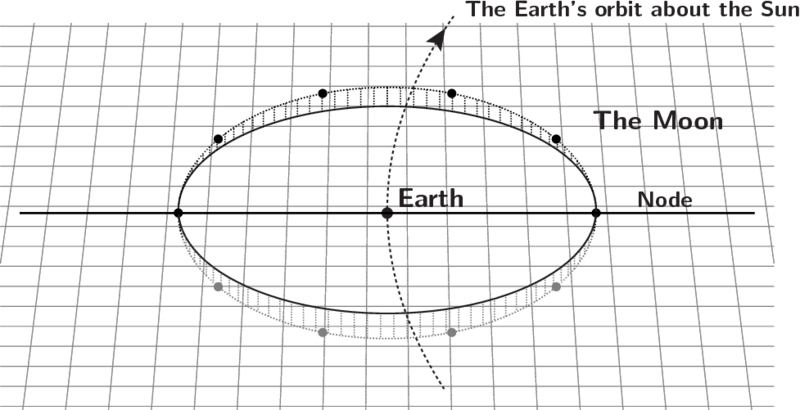 In the diagram to the right, the grid represents the plane of the Earth's orbit around the Sun. As it circles the Earth, the Moon passes through the Earth–Sun plane twice each month, at the points on the left and right labelled as nodes. A lunar eclipse results when one of these node crossings happens to coincide with full moon, which happens roughly once every six months. Eclipses of the Moon are visible anywhere where the Moon is above the horizon at the time. Since the geometry of lunar eclipses requires that the Moon is directly opposite the Sun in the sky, the Moon can be seen above the horizon anywhere where the Sun is beneath the horizon. The map below shows where the eclipse of September 17 will be visible. Map of where the eclipse of September 2024 will be visible. Click here to expand. The Moon 23h44m -02°46' Pisces 33'24"
You may embed the map above in your own website. It is licensed under the Creative Commons Attribution 3.0 Unported license, which allows you to copy and/or modify it, so long as you credit In-The-Sky.org. © Collin Grady from Las Vegas, Nevada.